Roles are assigned to staff members and determine their C1 access privileges. C1 ships with three built-in roles that cannot be edited or deleted - 'Account Admin', 'Admin' and 'Technician'. 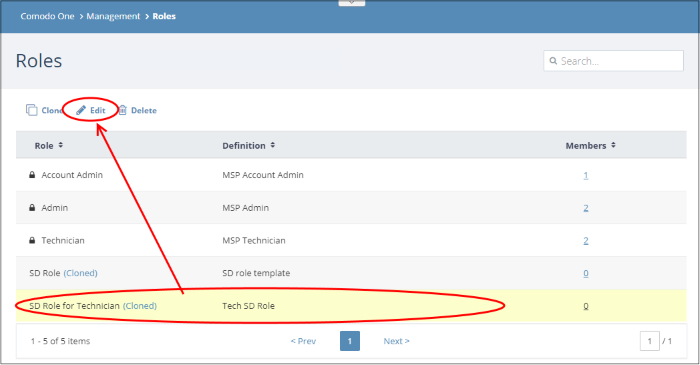 You can create custom roles by cloning the 'Admin' or 'Technician' roles then modifying their privileges. You cannot clone the account admin role. 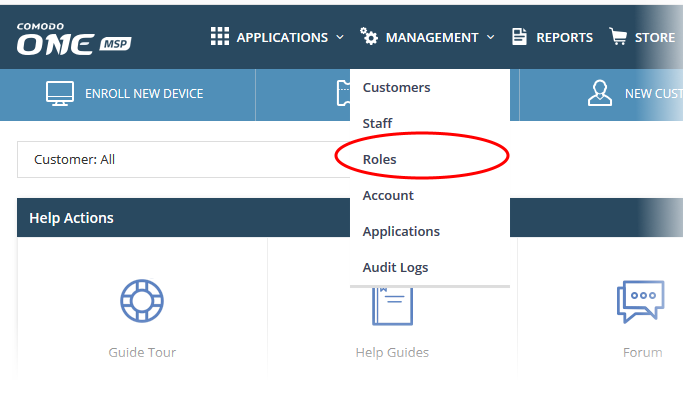 All built-in and custom roles are available for selection when creating or editing staff (see the previous section 'Manage Admins and Staff'). The label of the role. A role is a set of permissions and privileges within C1. A short description of the role. Built-in roles are prefixed with 'MSP' or 'Enterprise' depending on your account type. The number of staff assigned to that role. Click the number to see all staff with the role. Click any column header to sort the list of roles in ascending or descending order according to the column label. Filter the list or search for specific role(s) by entering the name or definition in the search field at top right in part or full. You can add a custom role by cloning an existing role then modifying the privileges as required. You cannot clone the 'Account Admin' role. Dashboard - View C1 dashboard and customize dashboard panes. Licensed Applications - Choose C1 modules that the role can access. Examples include Service Desk and Endpoint Manager. Reports - Access the 'Reports' menu. Create, view, schedule and delete reports. Staff Management - Access and manage staff and roles. Staff management rights let you create and edit staff members. 'Role' access lets you create and edit roles. Tools - View and download C1 tool sets. Customer - View and manage existing customers and add new customers. Applies to MSP accounts only. Notifications – View the latest news about Comodo One products via in-app notifications. 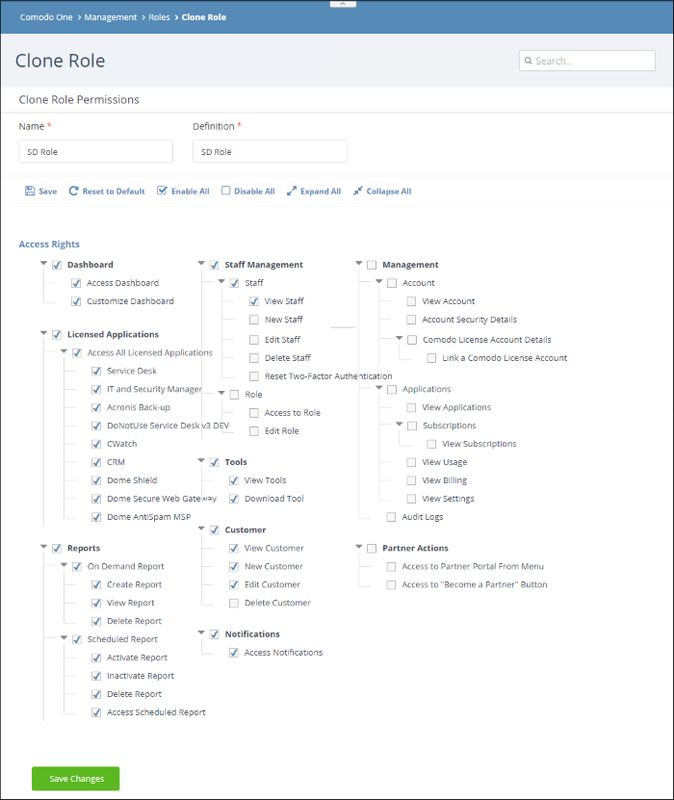 Management	– View account details and update support details. Access the applications menu to view current subscriptions, add new subscriptions, view details of application usage and billing. 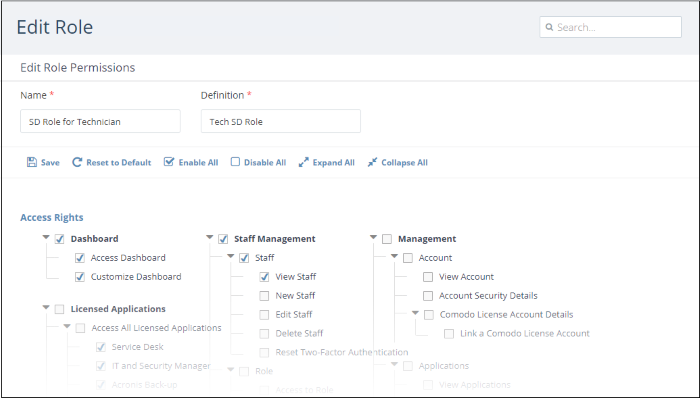 Partner Actions - Allow role members to become a C1 resellers. Resellers get C1 products at discounted prices. Click 'Save' at the top or 'Save Changes' at the bottom to apply your changes. Note: You cannot edit built-in roles C1. 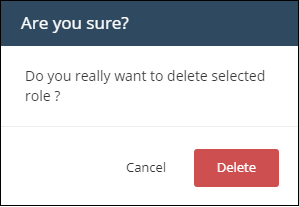 Click 'Save' or 'Save Changes' when done. The changes in the privileges to the staff members assigned with the role will take effect from their next login. 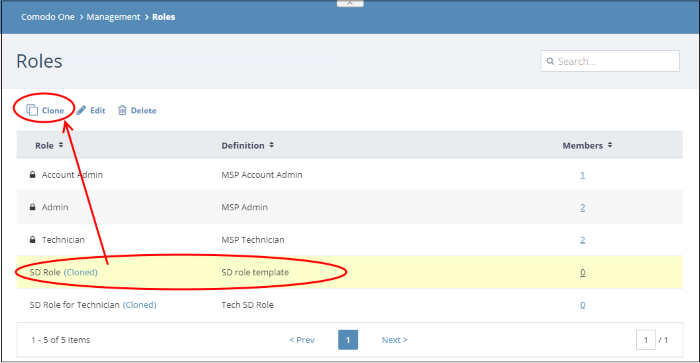 Note – You cannot delete C1 built-in roles and custom roles that are assigned to staff members. To remove a custom role, make sure no staff members are assigned that role.